20111208 - Up worked, Lunch, stopped by Courtland's and Best Transport. 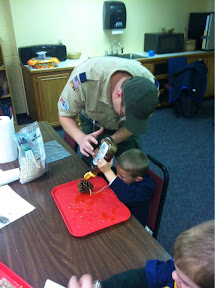 Home finished my day, dinner with the fam and then dropped D off at a friends and I took J&G to Scouts we made bird feeders out of pine cones, honey and bird seed (MESS!!!) Home up late watching movie. 20111207 - Work, break for haircut, dinner, D made honor roll, blockbuster, giant eagle for gift card, home watched cowboys and aliens. 20111206 - Worked all morning, watching, got grant, l had meeting, we got mcds, back at desk. dinner, reading with j, games with boys. out christmas shopping, disaster... home up late shopped on line, alsmost done.